Although poorly researched, betony has a wealth of traditional uses, with one classical writer recommending it for as many as 47 illnesses. 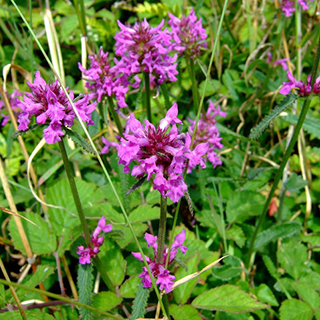 Wood betony is a nervine tonic and pain-reliever, good for treating nerve pain, toothache and headache. The herb supports recuperation from chronic disease or addition. Wood betony was once considered a panacea. Traditional uses range from treating battle wounds to protecting against the plague. Betony tincture or infusion has particular application in chronic nervous states involving mental overactivity. It will help to relieve anxiety and irritability, as well as accompanying symptoms such as poor concentration and headache. It may also be taken for dizziness and nerve pain. Take 2–4g a day, or max. 30g (1 oz) per week. Take 2–4ml a day, or max. 30ml (1 oz) per week of a 1:3 tincture. The fresh, bruised or mashed leaves make a healing and pain-relieving poultice for treating cuts, bruises, swellings, painful joints, splinters or ulcerations. Sow seeds spring in a cold frame. Prick out the seedlings into individual pots once they are large enough to handle and plant them out in the summer. Division in spring. The whole herb, collected from wild plants in July, when at their best, and dried. Collect only on a fine day, in the morning, but after the dew has been dried by the sun.